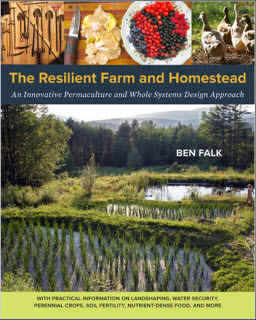 The Resilient Farm and Homestead: an Innovative Permaculture and Whole Systems Design Approach by Ben Falk, Chelsea Green, 320 pp, $40. “Imagine inheriting a food forest,” farmer and author Ben Falk suggests in The Resilient Farm and Homestead: an Innovative Permaculture and Whole Systems Design Approach. And although Falk does eventually go on to describe exactly how one would go about creating a low-maintenance, edible forest garden, the idea he poses ignites a greater question – what does it mean to leave a legacy and what will our children inherit on this earth? In an uncertain future with a declining economy in a world of rapidly disappearing natural resources, is accumulating individual wealth the best and most ethical inheritance for us to leave to our children? 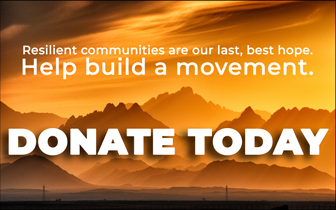 For Falk, the key ensuring the livelihood of future generations is not by amassing and passing down wealth in the traditional monetary sense, but by growing and creating your own thriving farm and homestead based on the concepts of regeneration and resilience – starting today. Whereas some books on permaculture take a more theoretical approach, Falk’s manual is rooted in direct personal experience, adding an element of credibility occasionally lacking in manuals that rely on theoretical knowledge and second-hand accounts. 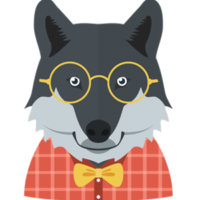 It is essentially a case study that describes what has worked and not worked for Falk and his team over the last decade at the Whole Systems Research Farm in Vermont. The term permaculture is introduced early on as a “design approach and framework for problem solving,” and although Falk uses the language of permaculture and its ideas throughout the work, more detail into the movement and specific principles itself is omitted in favor of Falk’s direct, practical experience. Early in the book, Falk creates a sense of urgency that now is the time to take responsibility for the future, and he describes how the long-term approach of creating a resilient and regenerative farm can and will sustain future generations. Subsequent chapters of the book give the reader the tools needed for creating such a farm and homestead, starting with the design process and moving deeper into chapters on specific topics such as water and earthworks, food crops and regeneration for the long haul. Most helpful, Falk includes what failed on his farm along with what has worked – for example, Falk continues to work on creating the perfect potting soil mix and has yet to attain the germination rate he would like to see (I can relate). As someone with prior knowledge of permaculture, the manual presents some new-to-me concepts (such as tall grass grazing as a method of building soil) and sparked many new ideas (here’s one: the exciting possibility of growing my own staple crop of rice on the East Coast!). Many of the lessons learned are most applicable to those living in a similar climate to the Whole Systems Farm in Vermont; however, the farm’s thriving ecosystem has been created on marginal land, and Falk stresses that the concepts can be transferred to other locations where only marginal land is available and creative solutions are needed. Falk also does a good job of breaking up the text of the manual by providing useful photos, graphs and anecdotes, as well appendices providing checklists and definitions of words and concepts. Falk encourages a shift from consumer to producer by replacing dependency with self-reliance. Permaculture is used as the lens for making this shift, a tool of empowerment that allows individuals to cultivate their own nutrient-dense food and create a productive and meaningful lifestyle despite ever-changing circumstances. The steps to make this transition are presented concretely and candidly. Ultimately, Falk is describing a transformation that starts within each person and inevitably extends to family, home, the land, the community and finally future generations. More than a just manual, this book inspires action, self-reliance and a kind of empowerment that can only be felt when you willingly tie yourself to a piece of land and begin to truly engage with the earth. Our current reality is constantly changing. There is no guarantee that the world will look as it does now in a year, much less ten or twenty. More often than I would like, this thought paralyzes me and fills me with a sense of helplessness. This book combats such a fatalistic view of the future by taking a positive, action-based approach. Perhaps this quote of Falk’s sums it up best – “be confident, try stuff.“ And today is a great day to start. A Virginia native, Jenna Clarke recently joined the ranks of women who grow food in the beautiful Shenandoah Valley. She is the Marketing & Outreach Coordinator for Project GROWS, a youth-oriented educational farm based in Verona, Virginia, as well as a fellow at the Allegheny Mountain School. Homepage image of rice paddies courtesy of Whole Systems Research Farm.